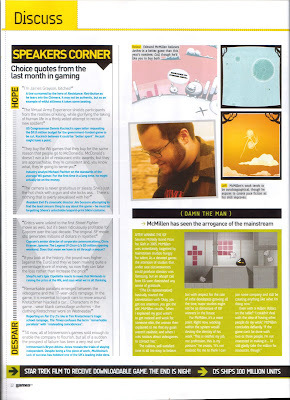 I got my biggest article yet in this months issue of Games tm. a 6 page article about innovation in video games and the IGF, they interview me and the tale of tales people about the direction of the indie scene and the importance of being indie.. its a great read if you live in the UK. ok well im all caught up, now back to work.